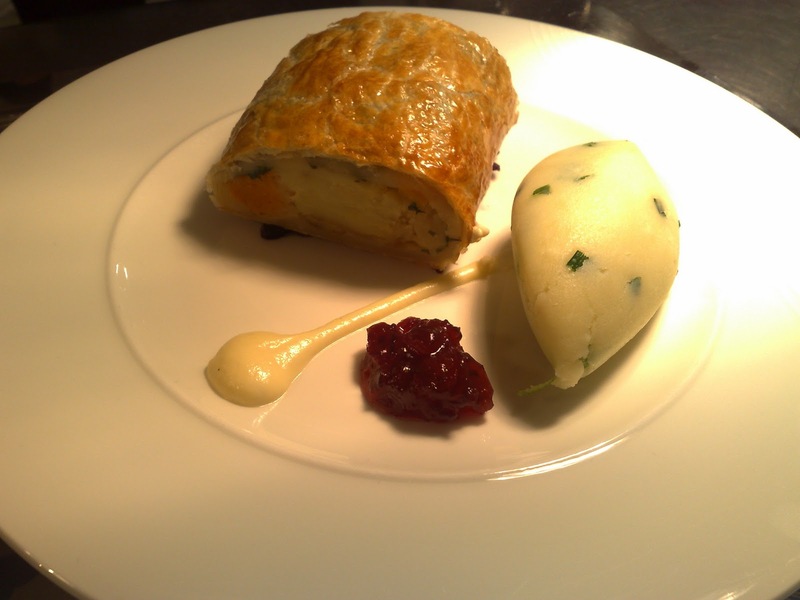 Kitchen Files: Winter Vegetable Wellington a perfect vegetarian alternative for Christmas day! Winter Vegetable Wellington a perfect vegetarian alternative for Christmas day! At the Merchant hotel we always have this style of dish on our vegetarian menu at Christmas; it is so versatile in that any selection of vegetables can be used. The cranberry jam in the filling adds a wonderful sweetness to the dish. Serve this with pickled red cabbage and mash for a great vegetarian Christmas dinner. Place the butter, onion, garlic and leek into a pan and cook over medium heat until softened, add the stock cube, sage and breadcrumbs and mix well. Remove from the heat and stir in the egg and parmesan, season to taste. In a large bowl mix the carrots, parsnip, cauliflower, quorn or tofu, cashew nuts and cranberry jam. Add the breadcrumb mix and stir until everything is incorporated. Leave to cool then place in the fridge for 1 hour. Lightly flour a work surface and roll out the pastry into a large rectangle, place the filling in the middle and roll into a large sausage roll shape, seal the edges with beaten egg. Score the Wellington with the back of a knife and brush all over with the remaining egg. Set in the fridge for a further hour. Pre heat the oven to 200c and cook the Wellington for 35-40mins until golden brown. Serve a slice of Wellington with a choice of vegetables, mash potatoes and pickled red cabbage.